Free Shipping at Educents - No Minimum Order! 48 Hours Only! You are here: Home / Educents / Free Shipping at Educents – No Minimum Order! 48 Hours Only! 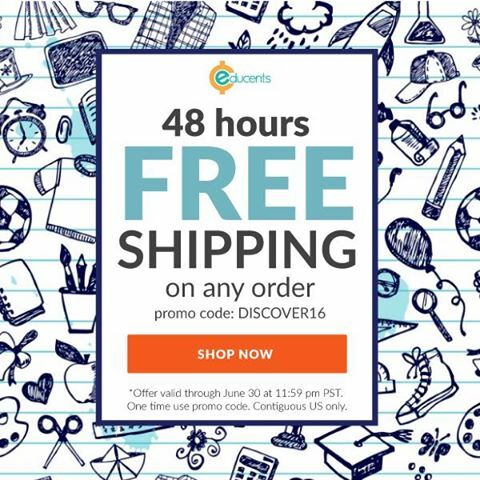 Free Shipping at Educents – No Minimum Order! 48 Hours Only! Through 6/30/16, you can get free shipping on ANY order at Educents. That’s right, no minimum purchase! Just use coupon code DISCOVER16 at checkout. Now is a great time to pick up your favorite homeschool resources like: Life of Fred, Times Tales, Maestro Classics, and many more! Click here to start saving during the free shipping deal now!